Pumpkin happens to be one of the rarely used vegetables for making dishes. However, it has multi-beneficial and especially, the pumpkin seeds have rich medicinal properties. Most of us are not aware of the benefits of pumpkin seeds – the routine is simply to cut the vegetable, remove the seeds and throw them away immediately! Apart from its special flavour, pumpkin has many other benefits. Especially, its seeds are far more valuable from the medicinal point of view. Pumpkin seeds are rich in fibre, protein, iron, and vitamin E. It also contains valuable minerals such as Manganese, Phosphorous, Magnesium, Copper, and Zinc, 100 grams of pumpkin seeds give 600 calories. Swollen prostates, diabetes, and high cholesterol are 3 diseases which mostly affect the men. Pumpkin and its seed contain a curing effect for this. Pumpkin seeds are rich in several essential nutrients as well. It gives multiple health benefits. Pumpkin seeds especially are rich in cucurbitacin. This cures the swollen prostates and also cures other related complaints. 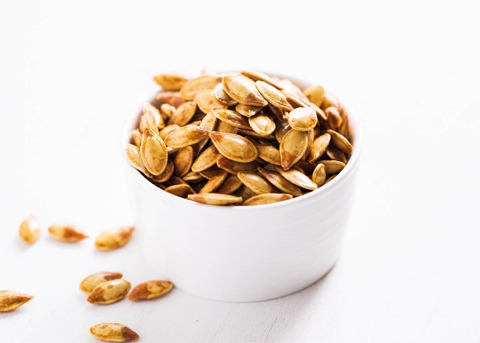 The element of zinc contained in the pumpkin seeds helps build body resistance to illnesses. An ounce of pumpkin seeds contains 2 milles of zinc. This helps the growth of cells. It is very much worth noting here especially the zinc deficiency may lead to complaints such as cold, fever, perennial fatigue, mental tension, facial pimples, giving birth to underweight children, etc. So, pumpkin seed are the ideal cures for the above complaints as they are rich in zinc. Pumpkin seeds also contain omega-3 acids, which are generally available from plant foods. This acid enhances the production of insulin. It also prevents diabetes. Women, by regularly (daily) taking a handful of pumpkin seeds fried in ghee can cure complains such menstrual pains and Leucorrhea (whiting). Drying the seeds under the sun (shade), and powdering it, and taking a spoonful dissolved in milk can enhance the physical strength.